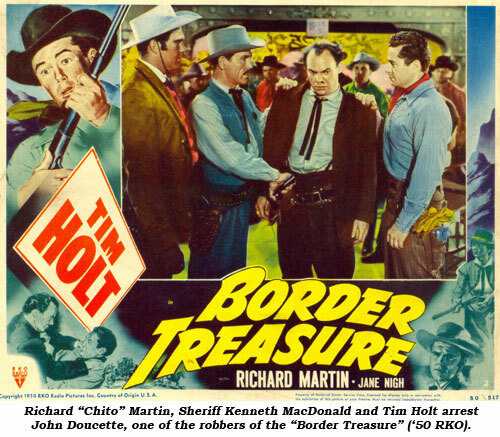 With a hefty build, menacing sneer and a booming bass voice, balding John Doucette was the perfect western badman and was equally adept in gangster roles. John Arthur Doucette Sr. was born January 21, 1921, the son of Arthur Doucette and Nellie Bishop, both natives of Massachusetts, in Brockton, Massachusetts. His father was a shoemaker and moved the family constantly from town to town, resulting in John being educated in 32 different grammar schools, eventually graduating in Haverhill at which time the family moved to California where he attended Lincoln High School in Los Angeles. By the time John graduated he’d been in three light operas, four Shakespearean plays and done 48 radio shows. Next stop was the Pasadena Playhouse where he performed in 27 plays in two years. During that time he appeared in his first film, “Two Tickets to London” (‘43). The draft during WWII interrupted John’s studies. He spent three years in Europe during WWII, first with the Air Corps driving a forklift in a warehouse, then in the infantry in Northern Germany including the Battle of the Bulge. He was also with General Patton in the final sweep. 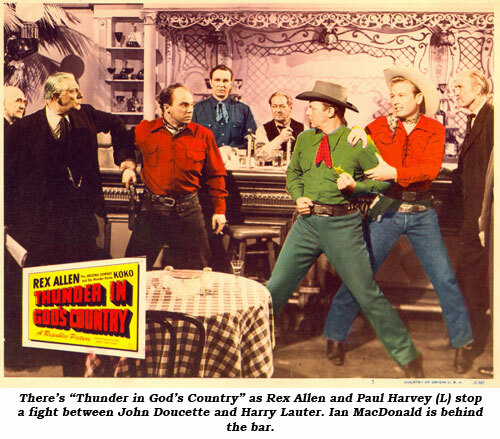 After the war a chance meeting with actor Don Harvey led to a role in Mae West’s cross-country tour of “Come On Up, Ring Twice” in 1947. By now John was beginning to work regular in films and, with a little money, he was married in 1948. Over the years he fathered eight children, five daughters and three sons. 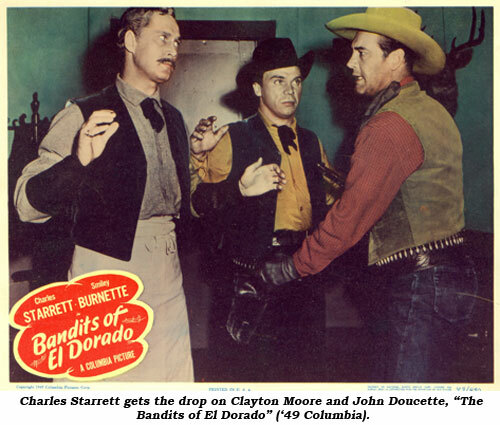 In films and on TV Doucette played gruff heavies, sheriffs, ranchers and townsmen. His characters were varied, both serious and comic. 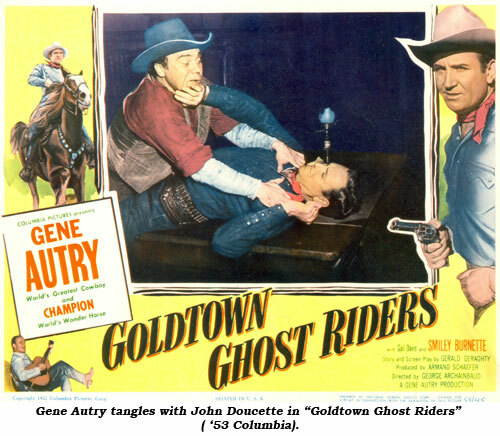 As the half hour TV western metamorphosized into hour long dramas, producers and directors began to see the softer side of Doucette, casting him in more sympathetic roles on “Wagon Train”, “Rawhide”, “Bonanza”, “Virginian” and “Big Valley”. Doucette also distinguished himself as a teacher of drama at the University of Portland where, in 1971, he was given an honorary degree in Fine Arts. He also was presented Lecturer of Communications Arts at Loyola and Professional Training Instructor in Theatre Arts for the California Educational Development Corporation at Palo Alto, California. Widowed at the time of his death, John died of cancer at his home in Cabazon, Riverside County, California, at 73 on August 16, 1994. His remains were cremated and returned to the custody of his daughter, Nicole Bulaich.